(Nanowerk News) Testing for ovarian cancer or the presence of a particular chemical could be almost as simple as distinguishing an F sharp from a B flat, thanks to a new microscopic acoustic device that has been dramatically improved by scientists at the U.S. Department of Energy’s (DOE) Argonne National Laboratory. The device, known as a surface acoustic wave (SAW) sensor, detects frequency changes in waves that propagate through its crystalline structure. This makes it ideal for detecting the presence of chemicals or biomarkers present in a liquid or gas. For example, it can detect cancer proteins attached to a receptor on the sensor surface. The surface acoustic wave (SAW) sensor detects frequency changes in waves that propagate through its crystalline structure. This makes it ideal for detecting the presence of chemicals or biomarkers present in a liquid or gas. For example, it can detect cancer proteins attached to a receptor on the sensor surface. The initial wave is created by a physical phenomenon known as the piezoelectric effect, in which an initial electric signal is converted into a mechanical displacement. This displacement takes the form of a wave transmitted through the crystal. In the SAW sensor, the signal travels like a seismic wave from the input transducer through the material to an output transducer, where it is converted back into an electrical signal. The wave's frequency is determined by the velocity of sound through the material, said Argonne nanoscientist Subramanian Sankaranarayanan of the Center for Nanoscale Materials, a DOE Office of Science User Facility at Argonne. 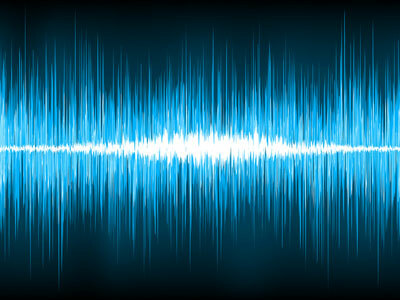 The usefulness of these devices as sensors comes from the ability of researchers to detect frequency, or pitch, changes in the waves as they propagate. The pitch changes are caused by changes in the density of the crystalline medium, which result from bonding of chemicals to receptors on the crystal or of proteins to antigens. “When something binds to the sensing layer, it changes the wave properties, and we can sense those changes,” Sankaranarayanan said. In collaboration with scientists at the University of South Florida, Sankaranarayanan added a new and important feature to these devices to significantly reduce their power consumption while simultaneously improving their sensitivity. One of the major benefits of these new sensors comes from the fact that they can, at least theoretically, be made battery-operated and portable. To do so, however, requires scientists to find a way to reduce the power the device needs to operate. “Making it portable means being able to operate at a very low power,” Sankaranarayanan said. First-generation SAW sensors lost much of the input signal due to properties of the crystal lattice. To fix this problem, Sankaranarayanan and his colleagues incorporated zinc oxide-filled microcavities designed to trap energy near the surface that otherwise would be lost to bulk waves – acting somewhat like bumpers in a bowling alley. According to Sankaranarayanan, the microcavities reduced energy losses by 50 percent. “This means we are one large step closer to making these hand-held biosensors,” he said. The work was funded by the U.S. Department of Energy’s Office of Science, and two studies based on the research appeared in Applied Physics Letters on June 23 ("Shear-horizontal surface acoustic wave phononic device with high density filling material for ultra-low power sensing applications") and IEEE Sensors on August 29 ("Low Insertion Loss and Highly Sensitive SH-SAW Sensors Based on 36° YX LitaO3 Through the Incorporation of Filled Microcavities").